TB160 rugged tablet conquers hostile environments including extreme heat, cold and rain, plus the IP65 and MIL-STD-810G rated that helps enterprise users to operate long time in the inside and outside. 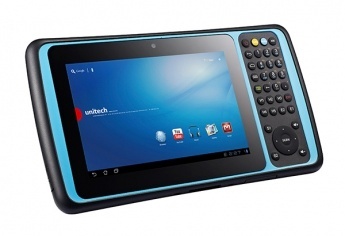 This rugged tablet adapts to your business needs in field service, transportation, logistics and warehousing. 2-megapixel front-facing camera for recording in the workplace. Moreover, this TB160 rugged tablet is durable enough to drop from the 1.5 meters onto concrete and it has IP65 certification, completely sealing durable housing against dust and moisture to withstand water jets. This device meets sturdy MIL-STD-810G military standard, boasting shock resistance, anti-vibration and together with a wide operating temperature range of -20°C to 50°C. The TB160 rugged tablet endures even the most extreme work environments. With built-in smart card/CAC and NFC reader (option), Wi-Fi, Bluetooth 4.0 as well as GNSS (GPS/Gloness/ Beidou), RFID reader and 4G connections, the TB160 Rugged Tablet also features all-day battery life with hot- swap capability that fulfills high flexibility for field services workers to get connected anywhere and offers seamless data collection and transmission for enhanced workflow. unitech offers a wide variety of accessories for the TB160 tablet PCs to transform base unit to fit different circumstances. It includes various docking solutions such as desktop cradle, vehicle docking station, extended battery pack and 2-Bay Battery Charger, as well as expansion module options (NFC+Smart Card Reader). The TB160 tablet comes with a 2mm stylus that delivers a convenient way for quick and accurate on-screen inputs. For more comfortable carrying of your tablet device, TB160 also add X-Type Hand Strap and shoulder strap that is easily accessible by the user and also helps in avoiding accidental drops or lost tablets.